The Port Authority of the Balearic Islands (APB) has launched a new edition of its long-running Painting and Photography Competition, a popular contest open to anyone that gains more and more interest and attracts outstanding participation each year. The entries submitted must depict one of the ports of general interest in the Balearic Islands or one of their lighthouses, and are broken down into 3 categories: Watercolour, Other Painting Techniques and Photography. The prize for the Watercolour and Other Painting Techniques categories is €2,000 each, whilst the winner of the Photography category receives €800. As usual, once the artwork has been judged, selected entries will be exhibited in Palma over the Christmas period. At a later date, the winning pieces and those submitted at the Port of Mahon will be shown in the Menorcan capital and, similarly, those submitted at Ibiza and La Savina Ports, along with the winning artwork, will be exhibited on the island of Ibiza so that island locals and visitors alike can appreciate the talent of those taking part in the ninth edition of the APB Painting and Photography Contest. 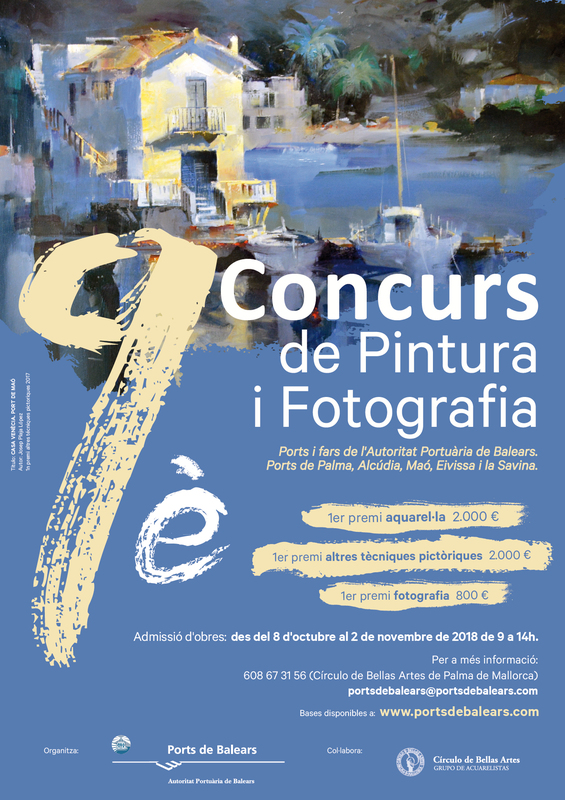 For the ninth consecutive year, the APB has sponsored this competition dedicated to the lighthouses of the Balearic Islands and to the ports of general interest of Palma, Alcudia, Mahon, Ibiza and La Savina, with the aim of capturing, by means of visual art, the popular interest that is aroused by places as ordinary and unique as ports and lighthouses and paying special tribute to them as parts of cultural heritage. Those interested in taking part may submit their entries at the offices of any of the ports of general interest between 8 October and 2 November 2018 from 09:00 to 14:00.